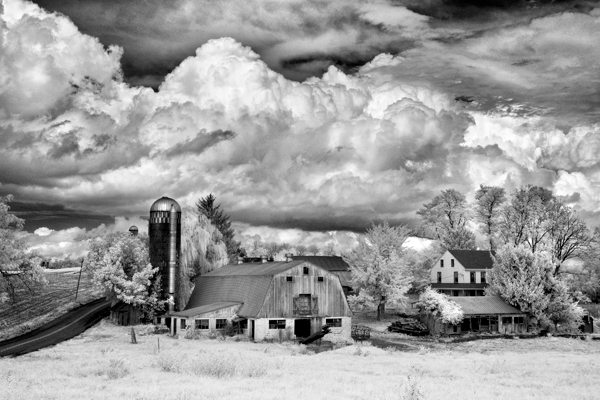 My image today features intense cloud formations that were blowing through the area, and lasted just long enough to allow me to run and get my infrared camera/filter combination. I actually think the clouds were more intense when I first saw them, but I am quite happy with what I got here. The shot was done using my old Nikon D70, which was excellent for capturing infrared images when used in conjunction with a Hoya r72 infrared filter. The downside is the fact that you can barely see through the filter,so essentially you focus the shot on your tripod and then add the filter on the lens before shooting. Exposures usually run from 1 second to 8 seconds at f16 in most situations,and you must remove the filter every time you do a new image. As things soon turn greener, Infrared effects will get even better. Many of you may have deduced by now that I have been thoroughly enjoying my visits to the old machine shop, and each trip is an opportunity to practice my light painting techniques in the hopes of getting better. 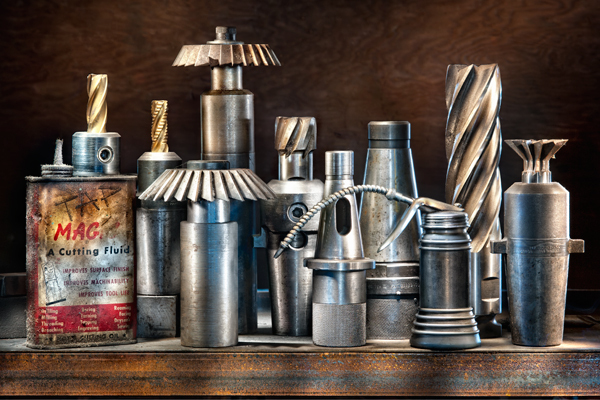 This past trip had me trying to come up with some earth shattering image, which wasted an hour of time till I finally decided to shoot this detail shot of end mills and tool holders that were on a shelf. I added the cool oil can and rustic old cutting oil can to spice up the shot. I settled on the tighter shot because I wanted my shots to have some diversity to them. The background is just a wood panel that was part of the shelf unit, and I lit it with a flashlight. I spent the morning sunday shooting with my friend larry who is light painting master, and we each did our best to do something unique at our local historical society. 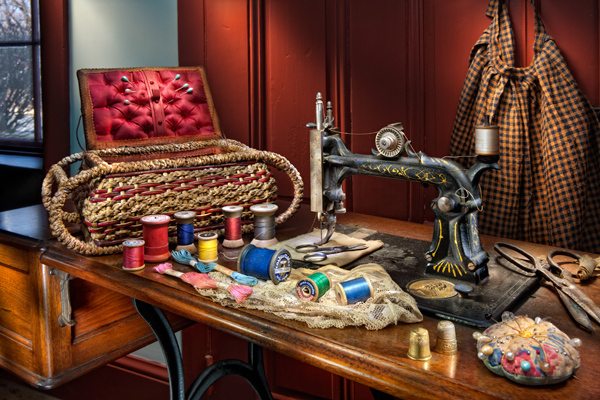 I chose an old sewing machine, and friends Margi and Dan loaned me several antique sewing items to help bring the shot to life. I used small pen flashlights and my big spotlight to accent the pieces, and the shot took me nearly an hour and a half to do. The best I could figure was this sewing machine is one made by the man who got the first patent for a lock stitch design in 1846, and his name was Elias Howe. Mr Howe had to defend his patent in court from 1849-1854, because he found that Isaac Singer, and Walter Hunt had been selling a facsimile of his machine and lockstitch design. He eventually won the case and won considerable royalties from singer. I can imagine the many hands that worked diligently on this machine in the late 1800s and early 1900s, creating garments and necessities for the family. My grandmother was a great quilter and I remember her working countless hours on her old sewing machine doing patches,and a few times over the years she would relay the stories of how a needle had gone straight through her finger and nail while sewing. Today both myself and my good friend Larry did some more shooting in the machine shop, but for some reason my decision-making was a bit out of whack, because it took me nearly an hour to pick something to shoot. Because of that indecision, I stayed at the machine shop till right near sunset, and then as I began heading home, the sky started to look promising. 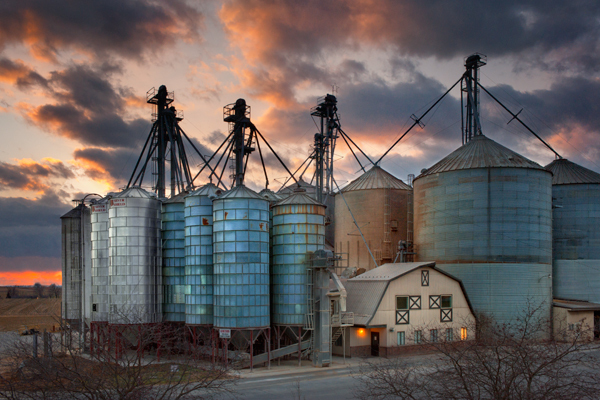 I decided to head to these grain silos in the hopes of a good sky, and it turned out to be an alright shot I guess. I like the varied hues of the old and newer silos and the warm vs cool tones. Once again I climbed on top of my truck roof to shoot this, and todays winds of 40 mph plus made for some tricky shooting up there. Since we are now into the weekend, I thought maybe its time to share another one of my misadventures near water. 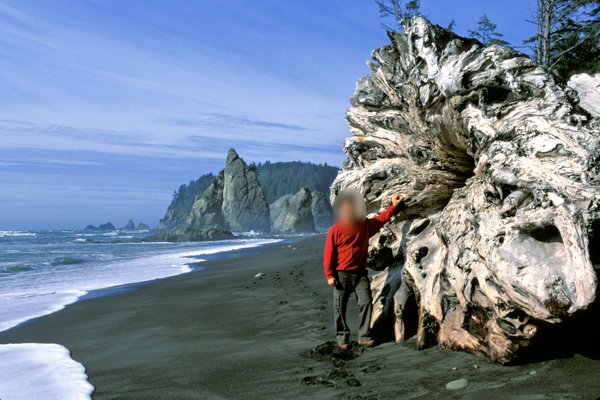 That blurred man in the lower photo is me standing on a beach in washington state alongside one of several dozen huge tees washed ashore. My morning started out with my wife and I taking in the beauty along the washington coast, and as you can see, sunny blue skies were in abundance. I said, lets walk all the way down to that island, which you can see in the background of my image, and I calculated it to be only a half hours walk. Well, we walked and walked, rested and walked, and as we get within a hundred yards of the island, you could see a fog bank quickly coming in off the ocean. I thought oh that’s neat, but that was only up until the fog got so thick that you could only see 10 to 20 yards in front of you. Now in most situations fog would not bother me, but guess what? As soon as that fog hit us, you could literally see the tide starting to come in, and on a normal beach one would just move up on the boardwalk or something similar, but considering the entire length of this beach was strewn with trees that had trunks 10 feet around, it was quite clear,we were not getting over them, and had to get back to the parking lot quickly. I was like a marine corps drill sergeant, telling my wife to keep moving as fast as she could, and carrying all my gear was really wearing me out. We went on and on, and waves were washing ever closer the entire time, and the final straw was realizing the little sign marking the parking area was nowhere to be found in the fog. we had no idea if we passed the lot a half mile ago, or had a half mile to go, UNTIL we saw the lovely bloated dead sea-lion that was washed up right at the path. luckily we noticed this poor creature at the beginning, and I can truly say I was never so glad to see a blob of blubber as I was that day. My heart was just pounding as adrenaline and survival instincts were on high alert. 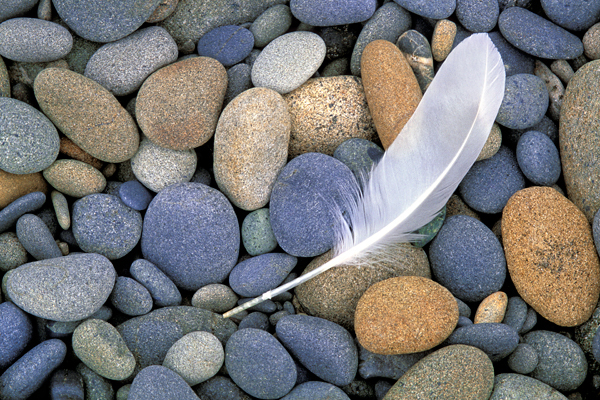 The calming feather on rounded stones image was taken the same morning, up the road a bit after our little nature hike. The whole ordeal was magnified in my mind as it was happening, because we had read many signs warning about getting trapped in coves etc along the beach at high tide. Just another great memory around the peaceful waters. For those who follow me here, and are not very familiar with me, nature and scenic photography is what most people know me for, so it is somewhat ironic that I post so many images other than that style here. I have found myself sharing things that I don’t always share in public, and I like to mix things up to keep folks interested. 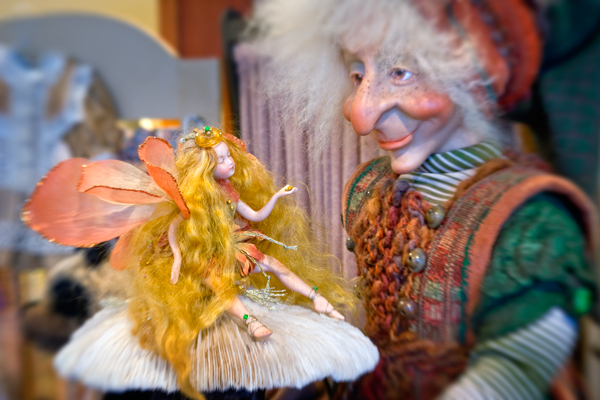 This shot from a local doll maker was done using a lensbaby,which creates a very specific plane of focus,depending on how you articulate the front elements. For me it was more frustrating than fun using it, so after the initial few days of trying it, it is now collecting dust. There are some neat shots on the lensbaby site, but I personally lost interest in it pretty quickly. This effect is exactly what the lens did and was not blurred after the fact. I thought this subject was a good choice to test this device out on, and I like the result on this image. I have always had a great respect for the Amish and their way of life, and even though they are not big fans of being photographed, I continue to capture the images that present themselves. I have seen so many things in the Amish community over the years,and I have countless memories of those experiences. The Amish have problems just like the rest of the world, and they have some very friendly characters and some unfriendly ones as well. I have watched younger kids get the greatest joy out of the simplest things, and know they are usually more content with an old tattered item than the person who has every electronic gadget. I have been invited onto hay wagons to shoot at harvest time, as long as faces are not shown, and have seen empty beer bottles flying out of buggies while a boom box blares inside. Hopefully I can share more stories and images of my experiences in the future. 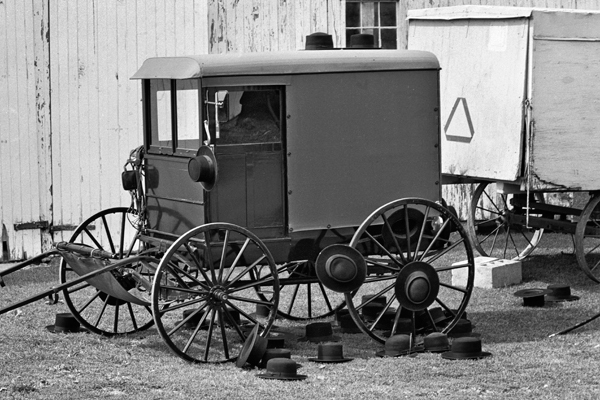 This buggy/ hat rack was captured a while ago on a sunday drive in the country, shortly after the men headed inside the barn to begin worship. I took this with a long lens from the road, but the day I took this, a tourist with a little point and shoot pulled up, got out and was on his way to the barn door when I basically told him to get the heck off the property. He must have figured it was some sort of scene that was staged for tourists. This was really the only buggy that everyone seemed to pick to place his hat, and looking at the shot now, I counted 32 hats scattered about.